My code calls a static/global function. Can I mock it? You can, but you need to make some changes. In general, if you find yourself needing to mock a static function, it’s a sign that your modules are too tightly coupled (and less flexible, less reusable, less testable, etc). You are probably better off defining a small interface and call the function through that interface, which then can be easily mocked. It’s a bit of work initially, but usually pays for itself quickly. So GoogleMock cannot be used to mock C functions directly. Though as the FAQ states, there’s a workable solution if you can re-jig your code. I ended up sticking with GoogleMock but going in a different direction. We’re starting with code from a reference design that I don’t want to change. We’re not comfortable with the hardware or the device drivers yet so re-jigging code this early, even though it’s not overly complicated, is something we wanted to stay away from… for now anyway. After pulling in the xiic_l.h header file and the stub, I made sure everything compiled to catch any silly mistakes. I did make a couple so I fixed them and moved on. 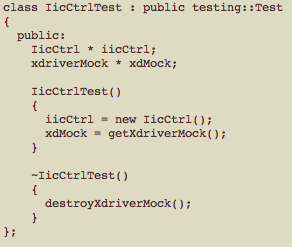 That test is for the init() method of the I2C controller. On the first line, we’re using the EXPECT_CALL to say the XIic_DynInit() global function should be called once during the test with an input value equal to the HDMI I2C base address. The second line is the call to the init() method. If the init() method does as we expect and calls the Xiic_DynInit function, we’ve got a passing test. If not, the test fails and our init() method needs some work! 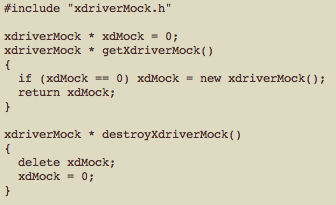 …and that’s how a rookie/pretend software developer uses GoogleMock to avoid changes to legacy code that uses global C functions from a Xilinx device driver :). I’m no pro, so I can’t say whether or not this is the ideal way. On the one hand I do recognize that this solution isn’t portable in the way that the GoogleMock FAQ suggests is possible. On the other, this was quite easy to put together and using it so far has been a snap. Time will tell whether or not we continue down this path or choose a different approach. If you’ve got any better ideas, I’d love to hear them… especially since we’ve got a long way to go until we’re done. It’s not too late to change!